About Us | AIR TECHNIC s.r.o. AIR TECHNIC s.r.o. founded – engineering, design, supply and service of HVAC systems, air conditioning and filtration. Activities expanded to absorption cooling. AIR TECHNIC s.r.o. becomes affiliated with Luwex, a.s. Expanded to biomass (wood chips) drying and handling. Funded research and development of wood chips gasification technology in co-operation with TARPO, located in Kněževes u Rakovníka, Czech Republic. Obtained certification ISO 9001:2008, ISO 14001:2004 and OHSAS 18001:2007. Completed first commercially proven wood chip gasification plant. Started independent wood chip gasification technology development of own design; ceased association with TARPO. 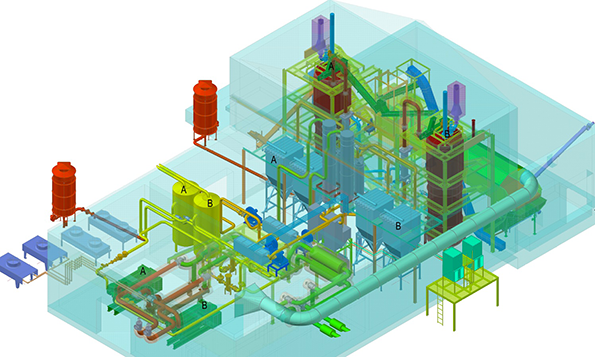 First gasifier plant of own design commissioned. Wood chip gasification technology of own design were developed and installed. Technical parameters and operational reliability were verified over consequent years of continuous operation. Gasifier technology is registered at the Offices of Industrial Ownership of the Czech Republic under the Paragraph 11, Section 1, Item No. 478/1992 Sb., in full, inscribed in the Register as UTILIZATION SAMPLE No. 28354. Cooperation agreement with EXPANDER ENERGY INC for the use of gasification technology in the production of synthetic fuels. CE marking – Technická inšpekcia, a. s. according to STN EN ISO / IEC 17020 has verified, that the Biomass power plant 999 kWe Handlová (SVK) has been assessed and meets the EU requirements for safety (Certificate No. 103/2/2016).